Enjoy our Vimeo Channel - Dog Wonder. This is a Community Service available free of charge. Create AKC Entry Forms OnLine. No more handwriting each entry! Maintain an OnLine History of shows entered. 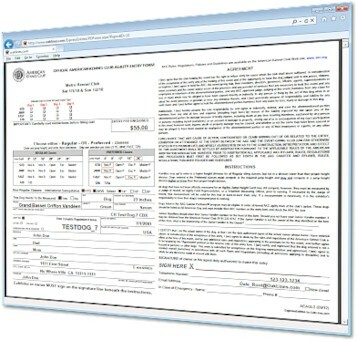 Create PDF AKC Entry Forms with all of your dogs infomation, including the show, fees and classes. Mail It off to the Superintendent or Trial Secretary.